Today’s guest is one of my favorite authors. To Catch a Leaf was my Favorite Read in 2011. The next book in the series, Nightshade on Elm Street, was released yesterday. Kate was nice enough to send me an Advance Review Copy and I read it as soon as it arrived and posted my review on October 9. I love the way Kate Collins writes. I love her characters and the clever mysteries she treats us to in each installment. I am so excited she is here today!! Please join me in welcoming Kate to Escape With Dollycas Into A Good Book. Today I killed someone. I planned it, executed it, and then covered it up. Then I began the search for me, following the clues to track down a tricky killer. I also ran a floral shop — making flower arrangements, delivering them, and worrying about my finances. Then I hopped down the street to become the macho owner of Down the Hatch Bar and Grill — concocting drinks and listening to my patrons’ woes. I was also a crazy artist, a shallow fashionista, and a millionaire cad, among other things. By the end of the writing day, my brain was fried. But then I had to step out of my make-believe world and start thinking about what to make for dinner, and what bills to pay, and did I have time for a load of laundry? Oops, forgot to schedule a hair appointment, renew my license plate, and take out the trash. Yeah, real life isn’t nearly as much fun as make-believe life. When I open up the file to work on my latest book, I step out of my stressful world and into one where I can make everything go my way – or nothing. I can bring out the sun, travel to another place, invent new friends, or do whatever my heart desires – as long as I write at least five pages a day about it. Not that it’s easy to describe a three-dimensional world using two dimensional words — and make it all seem real. But boy, is it rewarding. This was brought home to me the other day. I teach a creative writing class at a local women’s shelter, where I lead women of various ages in exercises that enable them to get out of the business/left side of their brain and shift to the right/dream side. This isn’t something they take much time to do, so it’s like a mini-vacation. This past Monday, I had them do right brain exercises that allowed them to see the creative process at work. At the end of the hour, a young woman thanked me for my efforts and broke into sobs. She said she had just been released from a year in prison and while there, learned the joys of losing herself in books. She’d never read much before and had now gained an appreciation of what it took to write one. She said she devoured every book she could get her hands on in prison and truly felt they kept her sane. What happiness it gave her to immerse herself in a place where everything turns out right, justice is served, and good people live happily ever after. Writing about those places is one of the greatest joys of being a writer. That, and knowing you’ve touched at least one reader’s heart. Thank you Kate for dropping by!! What an inspiring post!!! You keep killing and we will all keep reading and following the clues!! 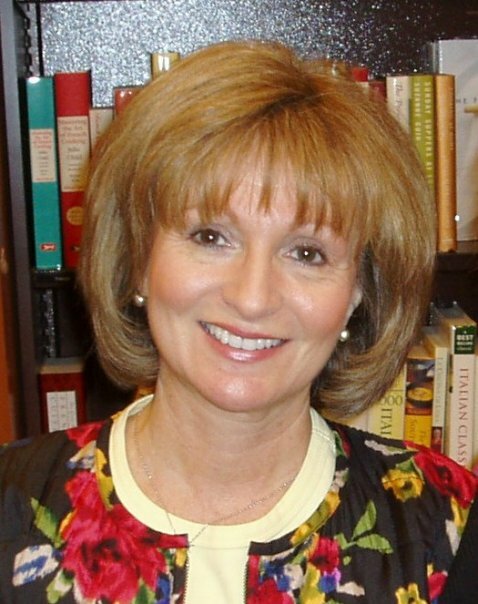 Kate Collins is the author of the national best-selling Flower Shop Mystery series. Her books have made the New York Times Extended Bestseller List, Barnes & Noble best-seller lists, the Independent Booksellers best-sellers lists, as well as lists in Australia and England. 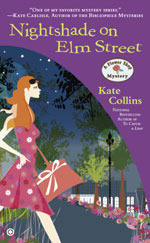 Kate’s latest mystery, Nightshade on Elm Street #13 in the Flower Shop Mystery series, was released November 6, 2012. All of Kate’s mysteries are available in print, digital, and large-print editions both in the U.S. and in the UK. Kate’s historical romances are also available in digital format at Amazon, B&N, and other e-book sellers. For more information, visit Kate at: www.katecollinsbooks.com. Kate’s blogsite is www.cozychicksblog.com . I can’t wait to read this one…. Love this series…. Kate, You’ve touched a lot more than 1 reader’s heart! Love your books! Great thoughts, love the story about the writing class and the woman that came up to you after. I know that really made your day and really brought home why you do what you do. We all need that kind of affirmation. Love this series and can’t wait to read the newest one. congrats on the new release. love the cover of this book. i love these kinds of books. thanks for the giveaway. Kate, I have read your entire Flower Shop series to date. Your books have gotten me through several health issues that I have suffered in the last couple of years. I am always looking forward to your latest installment! An enjoyable post and a great giveaway. Kate’s books are unique and special. Many thanks. Kate, I haven’t read any of your books–but based on your post, I am going to!!!!!!!!! Thanks for sharing a private moment with us, it really touched a lot of us. And I just have to say, I LOVE the titles of your books, too, too, funny! thanks for a chance to win! I love reading about flower shops since my grandparents once owned one—and when reading I can remember the wonderful smells of that shop. Thanks for the memories. I always say, it’s more fun to live in a book! Thanks for sharing with us! This sounds like a wonderful series. Your joys of writing sounds like my joys of reading. I can be a detective one day or a hopeless romantic the next. Thanks for stopping by! I love your satiric comedies. Since I have read this book and enjoyed it as much as the other ones in the series. I am not entering this contest. I have posted a review on my blog as I used the book as my N in the A-Z reading challenge. I love Kate Collins books. I can’t wait to read Abby’s next adventure. My best friend keeps asking me when the book comes out so she can read it after me. Creative classes are wonderful, i took one in college and enjoyed getting lost and away from reality. Your series started my love affair with cozies! Please keep writing these terrific stories. Good luck with your new release. Fun series! Welcome Kate! I really enjoyed your words and it certainly seems as though you heartily enjoy your work! As do we! Thanks for the chance to win! I just love the title of this book! It’s an attention grabber! I enjoyed Kate’s story of her creative writing class. Very rewarding! I would love to read your books. They sound very good. Thanks for the giveaway. Love your books Kate!!! Very entertaining! Sounds like a great book I would enjoy reading. What a wonderful blog post. Isn’t amazing how what you think is a simple thing empowers others beyond belief. Thank you for sharing Kate. Thank you for the giveaway. Kate, I have the first book in this series and I love the subject of your books. Cozies are my favorites. Kate I love your books and hope this series will continue for many years. I would love to be the happy winner. How touching that is, the woman finding solace by reading while in prison. Who knows, she might now go on to write a novel? I also find reading to be a great escape! I’m unfamilar with this series, but I LOVE a good mystery!! Cozy Wednesday Featuring The Chocolate Moose Motive by JoAnna Carl (Giveaway) Thankful For Books Giveaway Hop! !